BATON ROUGE, LA (WAFB) - No. 9 LSU rebounded from a loss earlier in the day to take the second game of the doubleheader and the weekend series over No. 11 Texas A&M at Alex Box Stadium Saturday night. The Tigers (23-10, 8-4 SEC) finished in convincing style with a 9-3 win over the Aggies (25-8-1, 7-4-1 SEC). 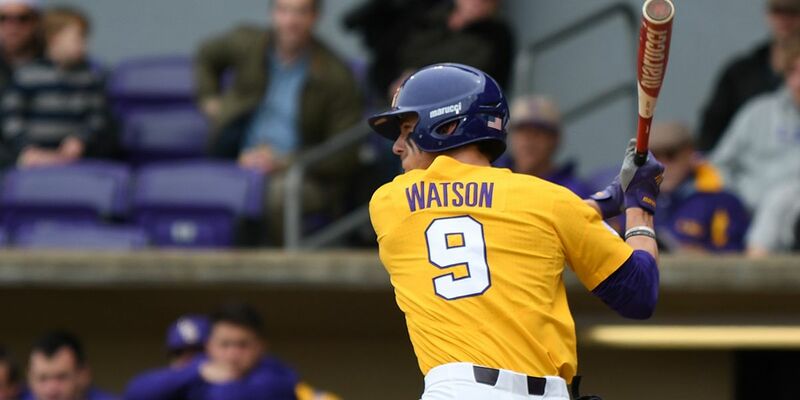 Zach Watson was 4-for-5 with a solo home run in the fifth inning. Cole Henry started on the mound for LSU. He allowed just two runs on six hits in nine innings of work. He struck out nine batters and had no walks. He improved to 3-1 on the season. Texas A&M jumped out in front early. A single up the middle scored two runs in the first inning for the 2-0 lead. The Tigers went scoreless for two innings and then took the lead in the bottom of the third. A double by Watson scored Brock Mathis and Hal Hughes to tie it at 2-2. Later, Watson scored on a single by Cade Beloso for the 3-2 lead. Watson homered to left field in the fifth to extend the lead to 4-2. In the seventh inning, a single by Antoine Duplantis sent Josh Smith home. A sac fly by Chris Reid allowed Watson to score. Then, a single by Brandt Broussard plated Duplantis for the 7-2 lead. In the bottom of the eighth, Smith hit a two-run shot to make it 9-2. Texas A&M scored another run in the top of the ninth.